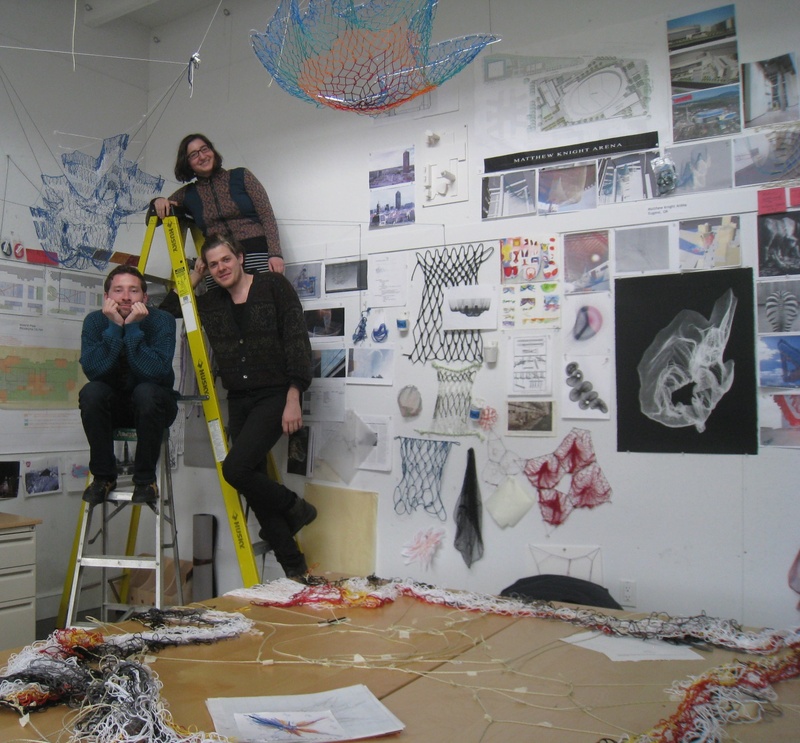 “When we find out about a project we let our minds’ wander about what should actually be there,” and the fun begins for three BAC students who are working in the studio of local sculptor Janet Echelman. The studio focuses on public art and urban transformation. Lucca Townsend says that her favorite part of the process is the brainstorming and idea generation. Somebody throws an idea out, then another and another, generating ideas and discarding them, finding what works for the particular place. Likewise Daniel Zeese loves the iterative design process, and he has been working in Janet Echleman’s Studio for two years. The Studio makes giant suspended net installations. 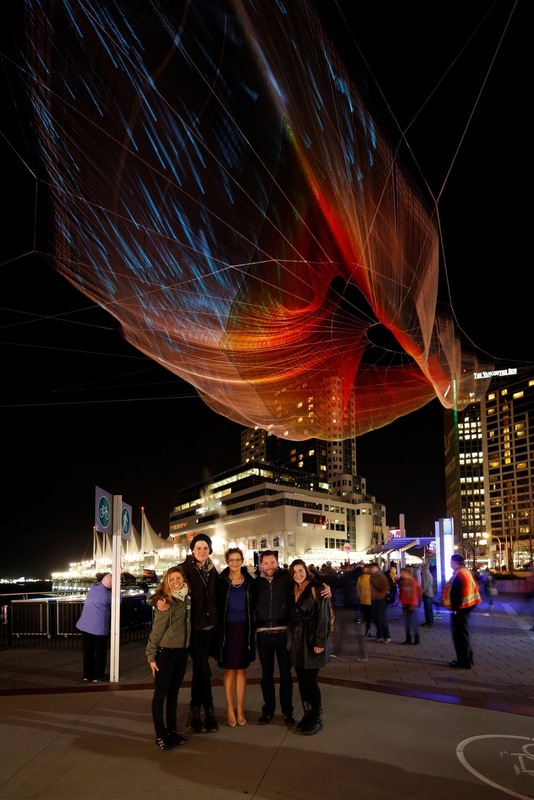 Recently, Cameron Chateauneuf, Lucca Townsend and Daniel Zeese all contributed to the final design of the 745 foot installation that went on display in Vancouver, Canada in March 2014. Check out the below. The design underwent many changes and one of the challenges was working with specially designed software to digitally model the nets. The software is brand new and the design complex, so when it was being modeled the designers would actually have to sit and wait for the “net to drop” before moving to the next iteration. Sometimes the software wouldn’t even be all the way through modeling before they were back in there adjusting the design. And unlike CAD or any of the software we use in school regularly, you can’t just do an internet search for how to use it. This software was specifically designed to model the nets, so it’s either contact the software designer at Autodesk or figure it out, if possible. The roles and responsibilities of these practicing students are varied; brainstorming ideas for new projects, software design iteration and even helping to create a TEDtalk. For only a few minutes of video a huge amount of back-of-house work gets done. Syncing video with the speaker’s words and finding a concise way to get the message across are some of the many tasks. One of the largest challenges in making giant net art is actually managing the installation. Most of the designs are installed in a square or plaza which requires a complex series of negotiations. The net is anchored to an adjacent building (one owner), then another building (another owner). Somebody owns the plaza and somebody else owns the air rights-the air above the plaza! Daniel says that while working with so many different parties is a challenge, it’s rewarding too. It allows him to get all these different people excited about the project, and actually seeing 700 feet of art installed in open air is a whole other level of satisfaction. During spring break all three traveled to Vancouver, BC to see the installation of Echelman Studio’s most recent project. Lucca spent months modeling the net, but it was still a beautiful and new experience for her to see it move with the wind. There is something infinitely satisfying about the culmination of all that work and effort, and while the three were out exploring the city, they mentioned walking around and catching glimpses of it again and again.